This is not a review of Victor Hugo's novel. Nor is it a review of the tremendously popular stage production. It is a review of the new film by Oscar-winner Tom Hooper (The King's Speech). Got that? Good. From the opening sweeping shot of a huge ship being pulled into the dock by down-trodden criminals singing the dirge of 'Look Down', we know what we're in for. The clue is in the title. This is miserable. 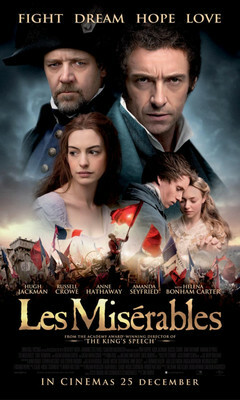 Hugh Jackman's Jean Valjean – imprisoned for stealing a loaf of bread to feed his starving family – is the focal point of the film. His relationship with lawman Javert (Rusell Crowe) is explored over more than a decade, against the backdrop of the student-led French revolution. His rise from prisoner to runaway to respected mayor provides the over-arching story, while colourful characters he meets along the way fill in the rest. Early on it is the impoverished waif, Fantine (beautifully played by Anne Hathaway). Cast out from her job in Valjean's factory, she seeks coin to support her daughter by selling her body (both physically and metaphorically). Valjean takes pity on her and takes her daughter into his own custody and away from scheming inn-keepers Helena Bonham Carter and Sacha Baron Cohen. 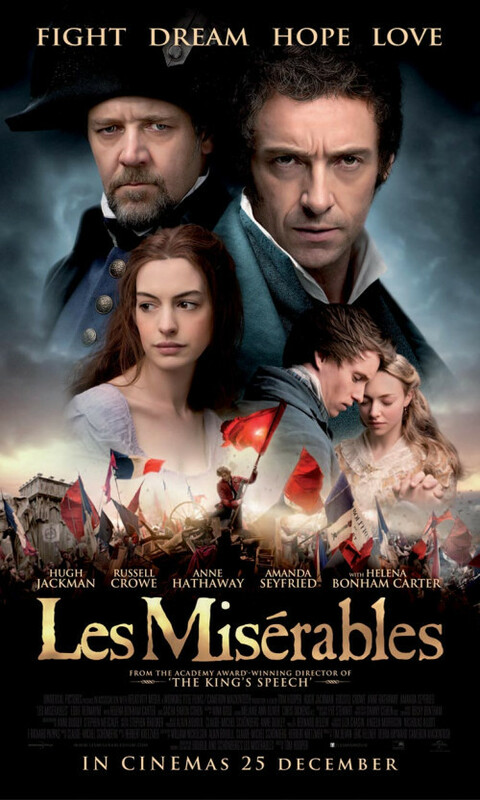 As Fantine's daughter, Cosette (Amanda Seyfried), grows up, she becomes romantically involved with Eddie Redmayne's Marius, while he takes a leading part in the revolution. All the while, Javert continues his pursuit of Valjean. Tom Hooper's decision to have the actors sing in the scene as live is a masterstroke. The film offers what the stage production cannot, and delivers in abundance. The marvelous use of lingering close ups and the sweeping camera work provide the film with both a tragic intimacy and a true sense of the cinematic. Every nerve, every sinew, is seen strained and throbbing as the flawless cast belt out tune after tune. Already something of a cliché to say, Anne Hathaway's rendition of 'I Dreamed A Dream' is one of the most honest and moving pieces of cinema in recent years. If you don't uncontrollably weep, you're made of stone. The beauty of the film is in the fact that not all the notes are perfectly hit. There are times when the reach seems too much, too ambitious, but the honesty of the performances ensure that it is not an issue. Despite the singing, we believe entirely that these are real people embroiled in real, tough life situations. The love triangle between Marius, Cosette and the tragic Eponine (Samantha Barks) is beautifully realised, and played to perfection by the three actors. Redmayne proves to be something of a revelation. Not only is he a frightfully good-looking and engaging screen presence, but he has a remarkable voice to boot. Like many other parts of the film, the final set-piece is sure to leave audiences with their spines tingling and their hairs standing on end. Les Miserables is a fine example of the true power of cinema. Majestic filmmaking of the highest order.